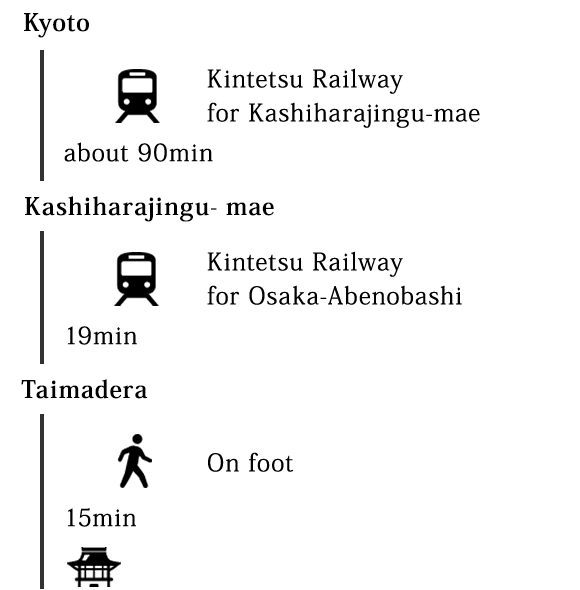 Taimadera Temple is located in the ancient Japanese city of Katsuragi, Nara. 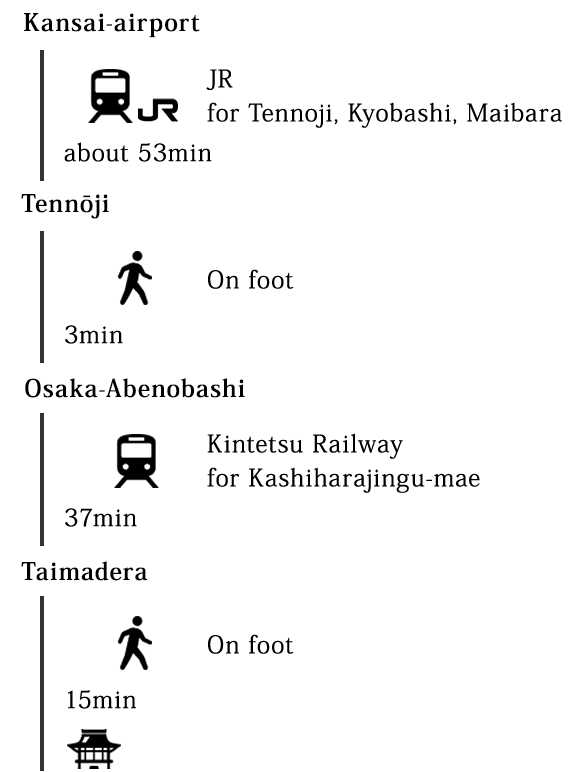 It is in an area one hour away from Osaka, the second largest city in Japan. Taimadera is one of the oldest temples, built more than 1400 years ago in 612 AD by Imperial Prince Maroko, the younger brother of the legendary Japanese Imperial Prince Shotoku. It houses the oldest surviving clay Maitreya statue in Japan, the “Miroku Bosatsu (681 AD, National Treasure)”, the astonishingly still standing and Silk Road-influenced “Statues of the Four Heavenly Kings (681 AD, ICP), and it also houses “The Taima Mandala (763 AD, National Treasure)”, a mandala woven from lotus threads, taken directly from the tradition of Princess Chujo, an indispensable figure in the history of Buddhist women. From Osaka Loop Line Tennoji Station (or Subway Tennoji Station, M23 or T27) - Kintetsu Line to Taimadera Station (F21), walk westward for 0.6 miles, and you will arrive at the Taimadera Temple Gate. As you pass through the fearsome gaze of the guardian Nio Statue, Taimadera stands with beautiful Mt. Futakami as its backdrop. 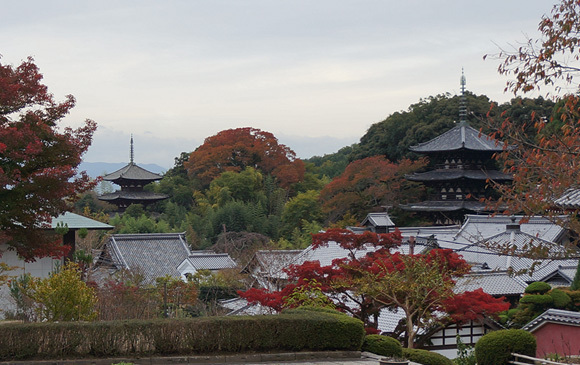 On the left, two three-story pagodas can be viewed on the east and west side of the temple, the only pair of pagodas in Japan that still exist as originally built. Both are designated as National Treasures, and were built in 750-800 AD. They were erected according to the Japanese “Ancient Temple Style”, with a symmetrically-shaped “Symmetrical Style” for its front. While many other ancient Japanese structures fell to war, weather, and fire, the two pagodas of Taimadera miraculously remain standing. Next are the three temple halls in the center of Taimadera. 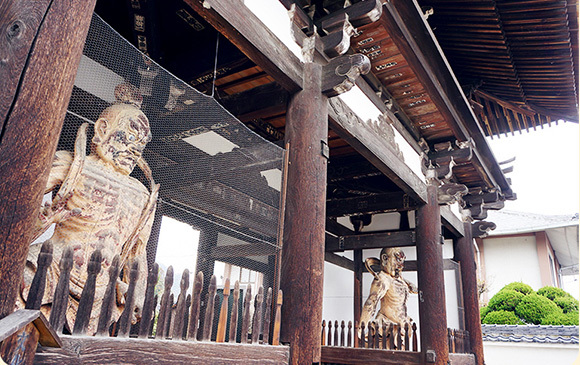 They are the Main Mandala Hall, the Kondou Hall, and the Koudou Hall. The Main Madala Hall is mainly used for worship, so in order to convey the true charm of Taimadera, we can begin with the Kondou hall. At the time of its construction, the Kondou Hall was built as the central hall of Taimadera. 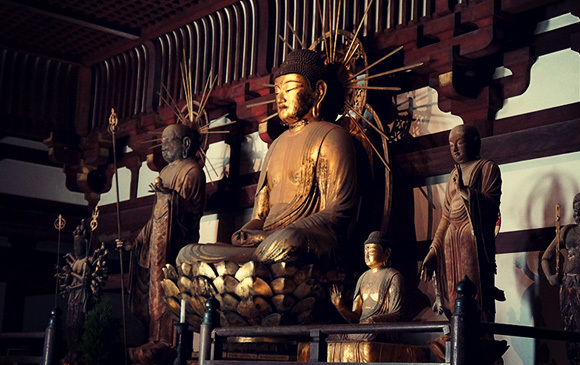 It houses the treasured Miroku Bosatsu statue within, a very special statue made of clay from the soil of ancient Japan. It is Japan’s oldest clay Buddhist statue. Why is a Buddhist statue made of clay so special? Because the Japanese developed their faith amongst the trees that sprouted from the earth from which the statue is made. It is also so fragile that should the heavy rains of Japan have made contact with the statue, it would have melted long ago. It is miraculous that the Miroku Bosatsu statue has stood for over 1300 years, protected by those that guard it preciously. 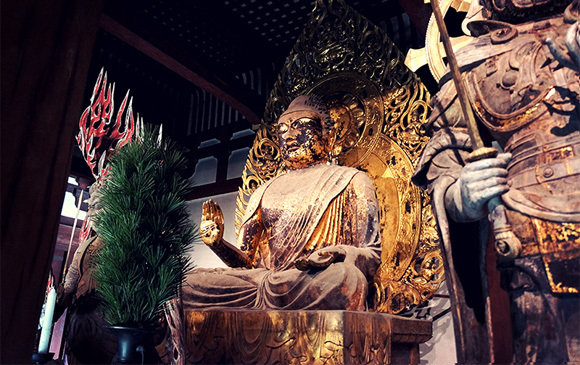 It was not only people that protected the Miroku Bosatsu statue through the years, but also statues of the Four Heavenly Kings, standing guard in all four directions surrounding it. 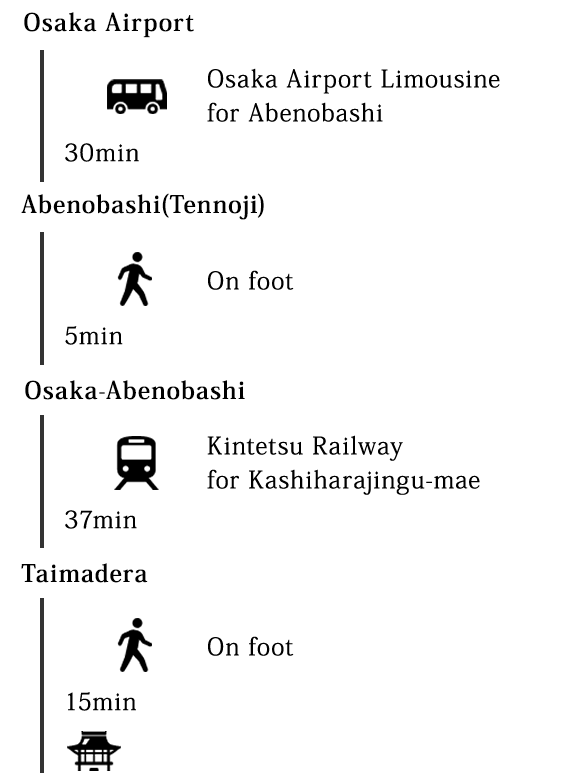 The one named Jikokuten protects the east, Zochoten guards the south, and Komokuten the west, all made from hollow dry lacquer. 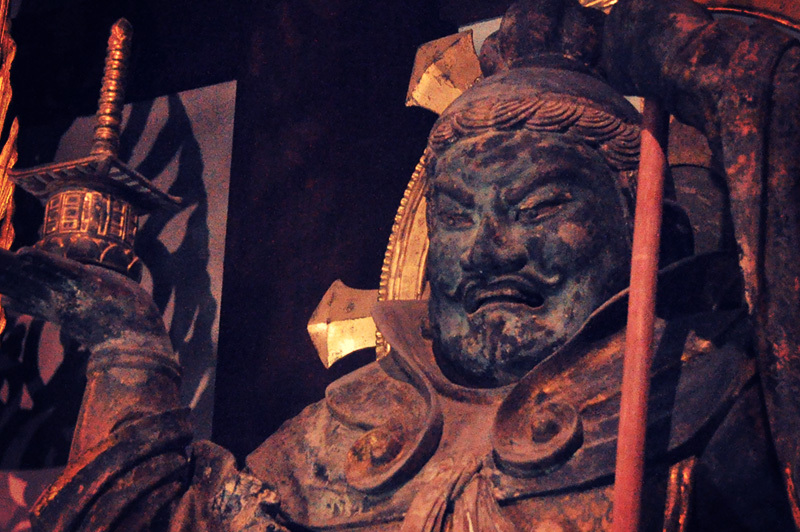 The original northern guardian, Tamonten, was destroyed in battle during 1181 AD, and was rebuilt from wood in the 13th century. With their characteristic beards, they evoke images of the ancient horsemen of Central Asia. 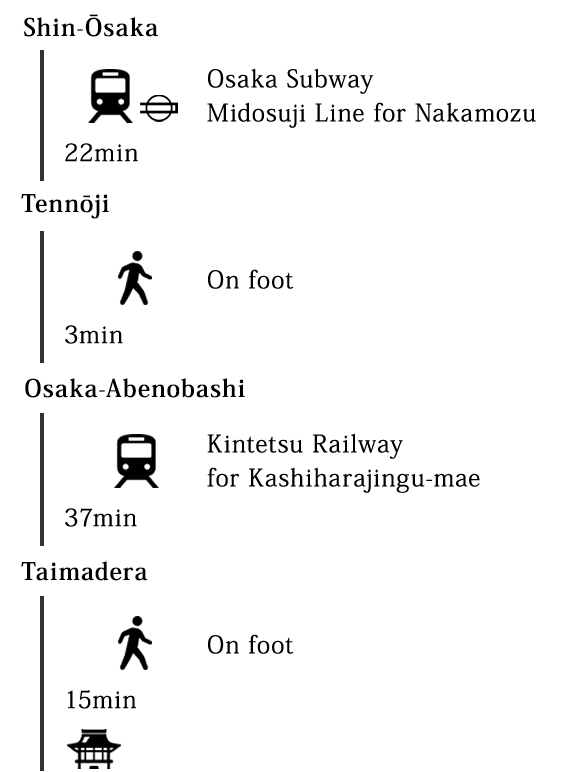 Through them, it can be seen that the reach of other cultures through the Silk Road extended completely to the eastmost areas of Japan. Each figure is arranged at precisely at 45 degree increments around the central Miroku Bosatsu statue, which along with the Kondou Hall itself, is facing southward. It is based around the ancient philosophy that “champions have a southern mindset”. It can also be seen that Taimadera itself was built facing southward, based on the configuration of its two pagodas. However, it is here where an ancient mystery exists: The southern side of Taimadera is not suitable as an entrance, as a mountain impedes it. As if the temple itself were meditation partners with the mountain, there is no way to enter Taimadera from the south. Why was the temple built in such a way? That mystery still has no answer. Please come and visit to experience the perspective of the people of that ancient time, and maybe you will come up with idea to solve the mystery! 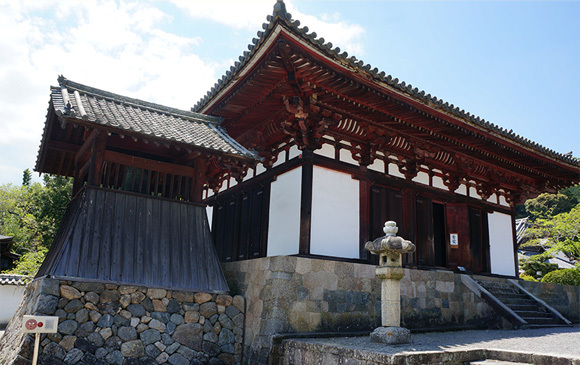 The Koudou Hall located to the north of Kondou Hall and is also facing southward. 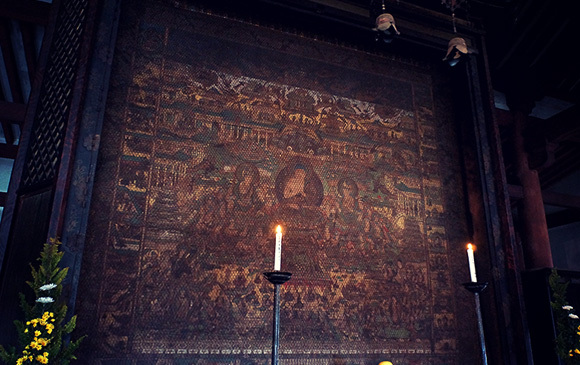 Inside are many beautiful Buddhist statues dating from the 9th to 12th century. It is presumed to have been a production center for many of the Buddhist statues in Taimadera. The Mandala Hall, or “Mandaladou”, is the main hall at Taimadera. It houses the Taima Mandala, a world-renowned artifact from the story of Princess Chujo, woven from lotus threads. 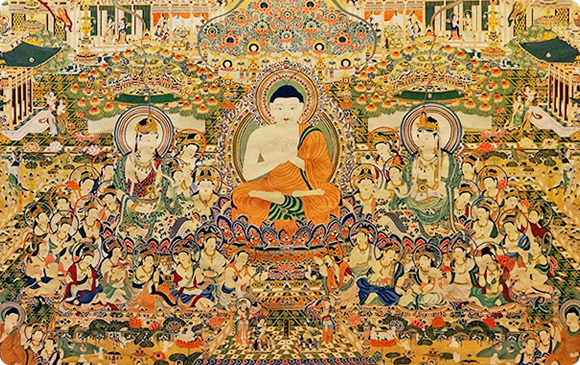 The special mandala has an area of 4 meters and depicts the paradise universe of Amida Buddha. It hails from a time when not all people were literate, so the mandala’s visual depiction of the world one experiences after death brought comfort to the minds of many. Even today, that sentiment remains largely unchanged. As the paradise depicted is located westward with the setting sun, and as more importance was given to the Taima Mandala, the primary axis of the temple also changed. It was originally built with a north-south axis, but later changed to east-west configuration. It is also of note that the manner in which the Taima Mandala is displayed utilizes the highest quality craftsmanship from the period. At the far end of the of perimeter is a building called the Okunoin. 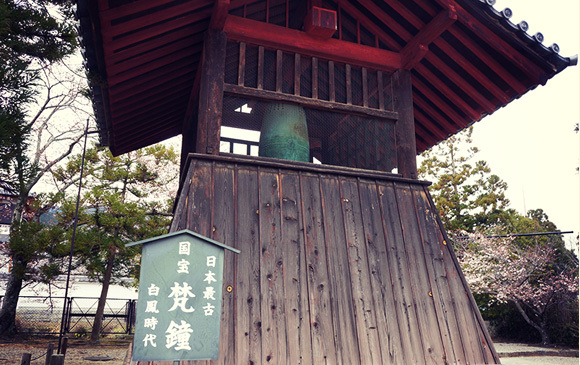 It was erected as a central temple in the Nara area by the Jodo-sect of Buddhism. It houses treasure halls, shrines, and a Pure Land Buddhist garden where people can pray to the remains of those who have passed. 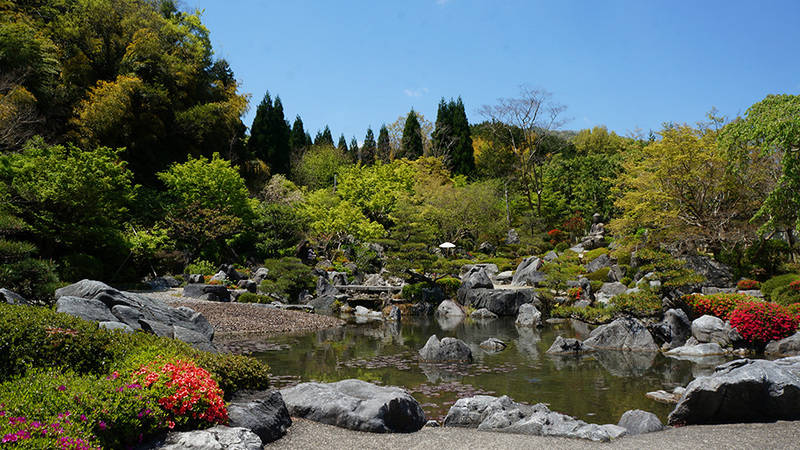 The Pure Land garden includes cherry blossom trees and peonies for the spring, and lotus and maple trees for the summer to enhance the enjoyment and beauty of the changing colors of the seasons.